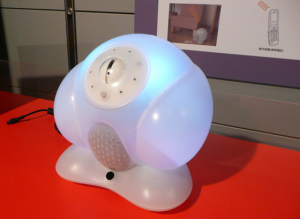 The House Sitting Robot is a cute gadget to take care of your house when you are not there. Now don't think that this robot will water your plants, take your pet out and look after your kids when you are not there. No, it does something far more important. It protects your house against robbery. Wow! You can go on an extended holiday without a single worry. Well, it doesn't actually fight off the robbers but it does manage to take neat photos of the culprit and promptly posts them to you on your 3G videophone. Presto! You have visual proof of who busted your house. But before you pick up the phone to call the cops you better check if the alarm was a genuine one and not just your pet accidentally knocking off things. Just for this purpose, the robot gives you a live feed to your videophone. So whether you are in Tahiti or in Paris, breathe easy. The House Sitting Robot will take care of your house and keep you informed about all intruders. Roborior, as this cute robot is called, unfortunately is available only in Japan and that too for $2600. We can only hope that this hot selling gadget of Japan will soon find its way to this side of the continent. I don't see how this would protect any home. Burglars aren't going to merely stand in front of the robot--wherever the homeowner just happened to set it--to get their photo taken before and/or during their ransacking. Unless the robot is capable of taking a photo of someone entering at any place in the home (e.g., back door, side window, garage, etc.) and at every angle and level, it is just an expensive gadget. Am I missing something? If not, then SELLING the useless robot for $2600 is a theft (forget the burglary). It should be installed in the bathroom of every restuarant, to monitor employees who don't wash their hands.